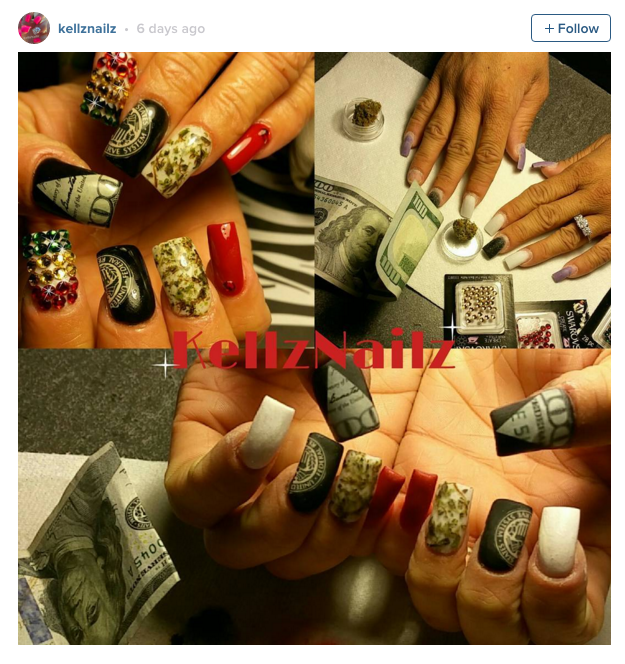 There have been some pretty crazy nail trends going around lately, from fur nails to bubble nails. 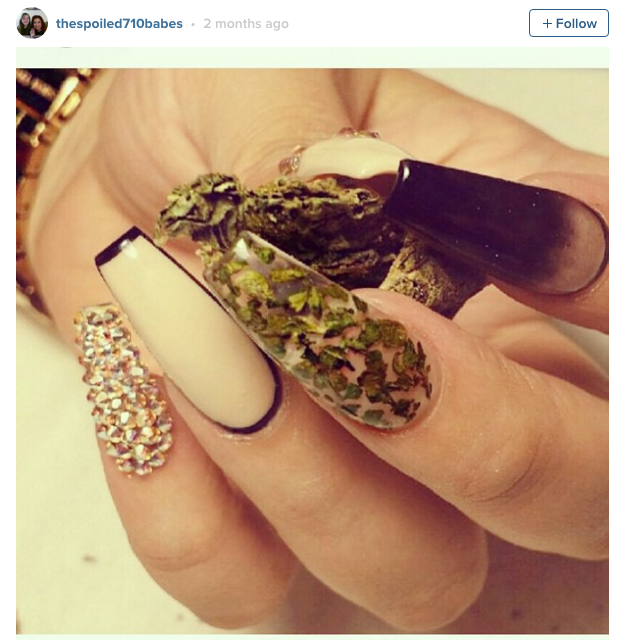 But “weed nails” may just take the cake. Louisiana Pham, the 31-year-old owner of Orchid Nail Lounge in Santa Clara, California, has been creating high nail art for over two years. 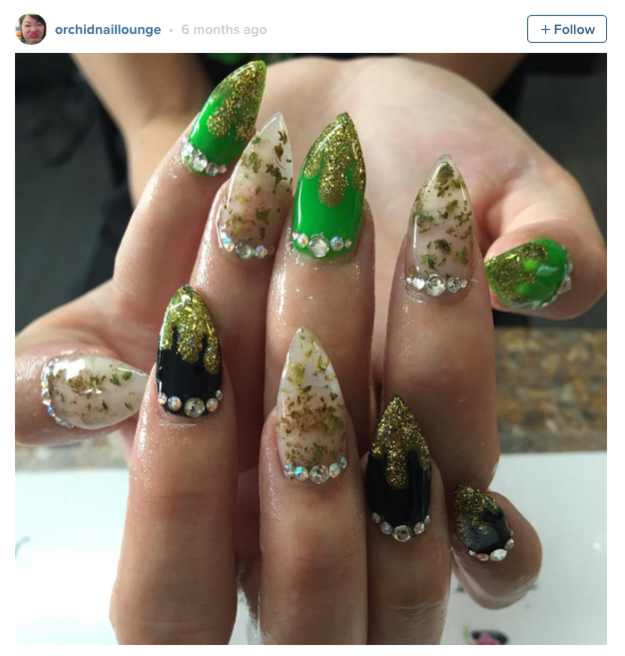 One of her regular clients, who is a cannibis patient, approached Pham about two years ago looking for a nail design to wear to a marijuana show called Hemp Con, Pham told BuzzFeed News. “Why don’t you bring in your own weed?” Pham said. “Oh yeah! 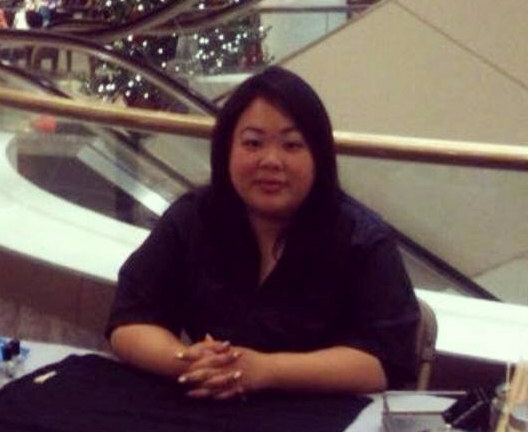 I’ll bring the bud,” Pham recalls her client saying. The two crushed up a bit of the client’s medicinal weed into tiny pieces. Then Pham encapsulated the leaves in gel polish on every other nail. She painted the other nails black and green with dripping gold glitter to resemble cannabis oil. The manicure was a big hit at the convention, said Pham. 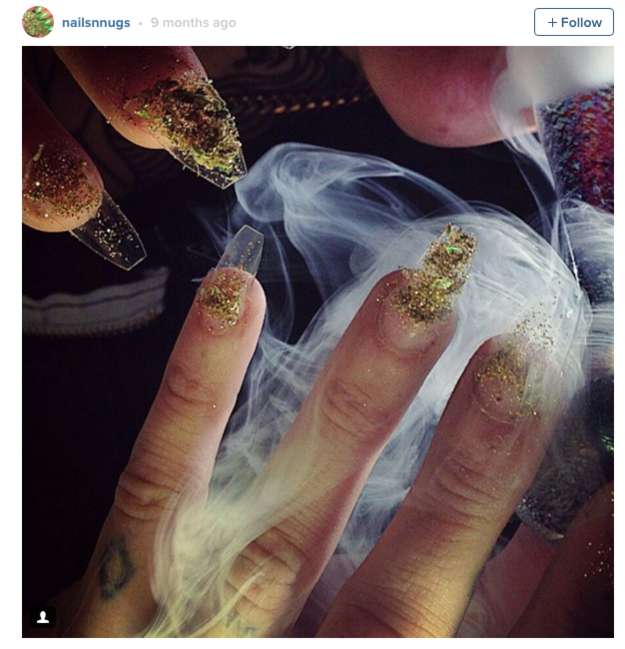 “People were stopping by her booth at Hemp Con just looking at her nails,” she said. But Pham’s client is not alone. The “weed nail” trend has flourished over the last couple of years as states begin to legalize recreational and medicinal marijuana, bringing potheads out of the shadows and apparently into nail shops. Pham calls them a “niche clientele.” She doesn’t charge anything extra for weed manicures, but does require that the client have a legal California cannabis card. She doesn’t have weed at her nail shop and requires clients to bring their own weed that was purchased legally. 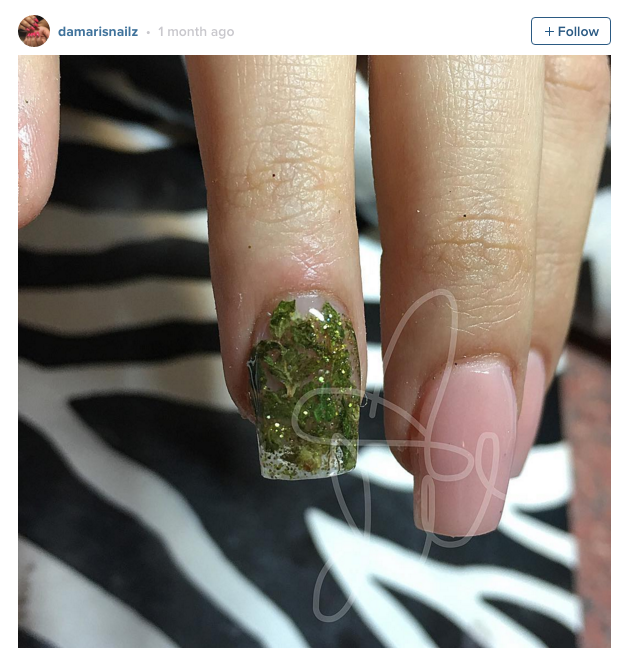 A typical weed manicure would cost about $65 at Pham’s nail shop depending on the number of designs. But it appears that these manicures sometimes come with a higher price. 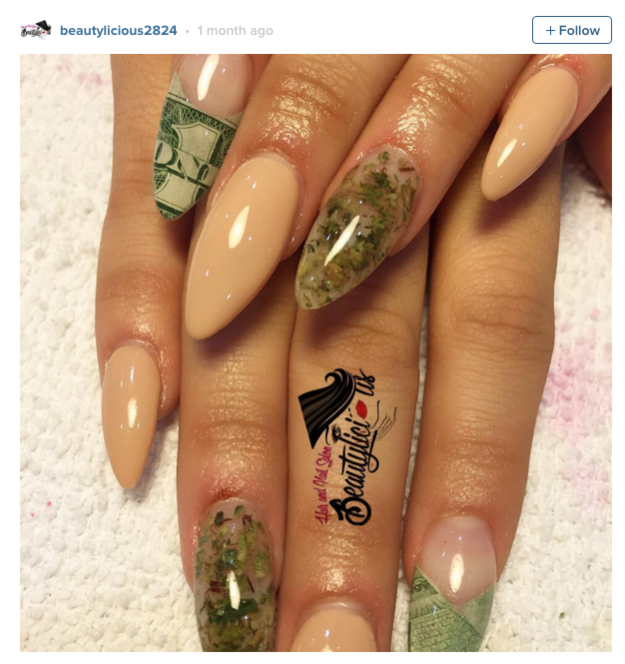 This manicure includes weed leaves and a $100 bill. 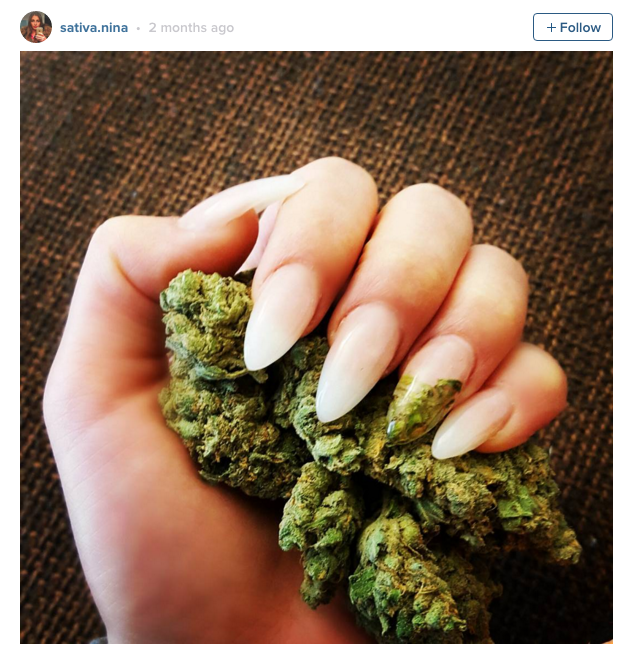 Other manicures keep it simple with a sheer nail polish and a single nail tip sprinkled with bits of marijuana leaves. 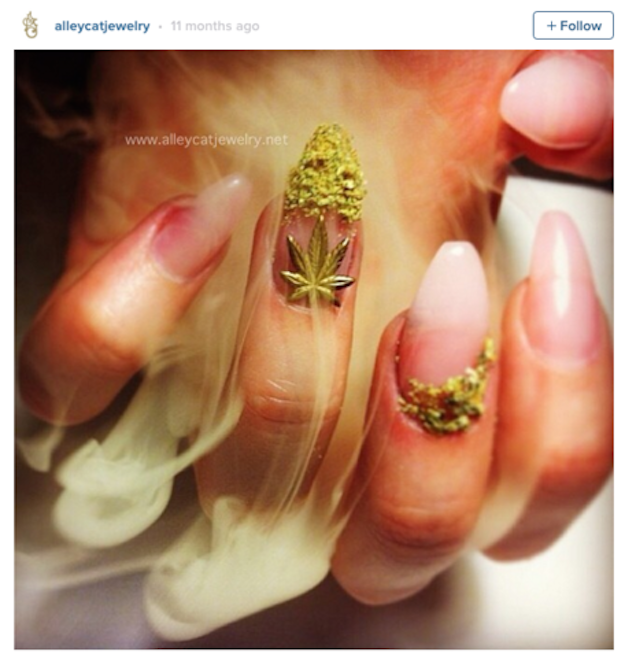 Ganja nails can be quite elegant. This manicure takes a minimal, but glam interpretation of the sticky herb. But before you grab a pinch of bud and head to your local nail shop, remember that weed is still not totally legal to possess in all states. “While it would probably be rare and ridiculous, it is possible that someone with marijuana stuck to their nails could be arrested or cited for possession by an overzealous police officer if marijuana is not legal in their state,” said Morgan Fox, a spokesperson for Marijuana Policy Project, in a statement to BuzzFeed News. Fox suggests people interested in getting a weed manicure review their respective state laws and policies. He adds that anyone who is interested in providing weed manicures should consult an attorney who specializes in this area for advice. While pot nail art may seem bizarre, Pham said she has done “crazier things” like creating 3-D art on nails or gluing seashells and real flowers to them. 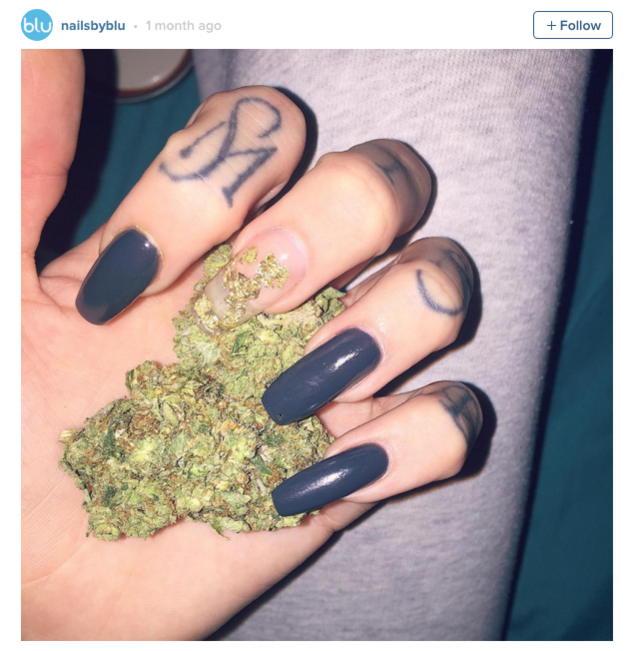 She said she had no idea that weed manicures were a trend across the country.